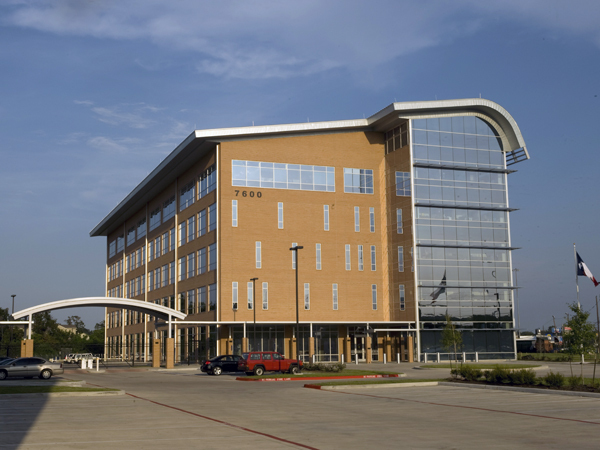 The 130,000 sf headquarters building is on a 16-acre site in western Houston along the busy IH-10 corridor; it houses TxDOT’s Houston District Headquarters operations. A stand-alone 14,000 sf laboratory and 575-vehicle parking garage share the site and were part of the project. The garage proved to be one of the more challenging elements for the structural design team. Though it is a conventional 3-bay, 4-level structural precast parking garage, the owner requested 61’-0” wide bays since many TxDOT employees drive oversize trucks. In response, each deck is comprised of 12’-0” wide x 28” deep lightweight precast double tees with a 2-3/4” thick normal-weight topping slab. The tees are supported by precast concrete girders and spandrel panels, which are supported by 24”x24” precast columns. Vehicular access to the upper levels of the garage is provided by a parkable ramp in the center bay, and pedestrian access is provided by stairs in the corners of the garage. The structure is laterally-braced for wind forces by precast shearwalls around the perimeter of the garage, as well as precast lite-walls along the length of the center ramp. The foundation of the garage consists of conventional cast-in-place spread footings.